Lately I've been on a yarn makeover. To keep myself from the urgent need to buy new yarn, I've been remaking old yarn with food dyes. Both the above and below images received a Kool-aid makeover last week. Because they were leftovers and mini-skeins, I wanted them in semi-solids for my baby sock blanket. The two above ended up as blue and an orange-y yellow. The two below got red and green overdyes to give the colors more unification. 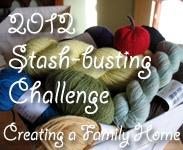 I am pleased with how the colors look in the skeins, so I'm hopeful that they will look good in the blanket. 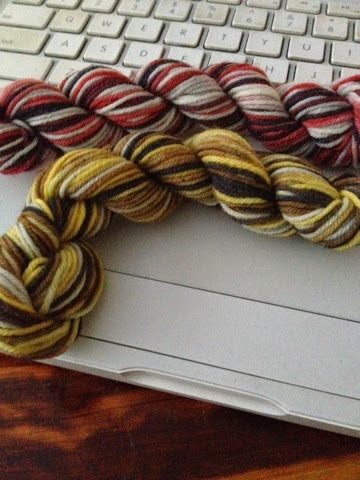 Last night, I got antsy again, and pulled out two skeins of Knit Picks Bare Worsted. 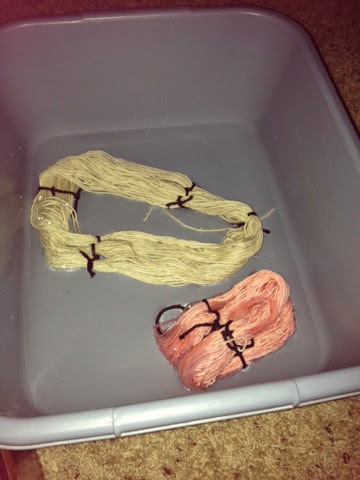 I soaked them overnight in the bath, and woke up at my normal time to add the dye and yarn together. (I didn't go to the high school this morning because they had prom day off). When I got up the second time, it was very clear that I needed another round of dye. Below you can see the yarn, which had become light blue-green, with some of the new dye on top. 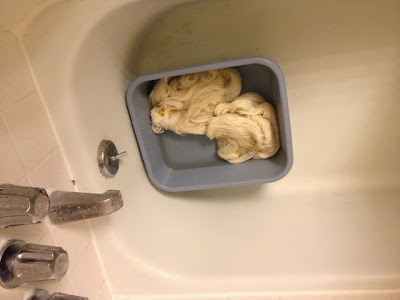 When I left for school, most of the dye had absorbed, so I turned the heat off to let it cool. I usually find that leaving it like that allows the dye to absorb more. It may seem silly to dye yarn in the morning before going into work, but I find that it allows me to have more patience. 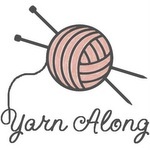 Or at least, it gives yarn a rest. I won't be able to knit it for at least a few more days, so dyeing it slowly never seems to be a problem.